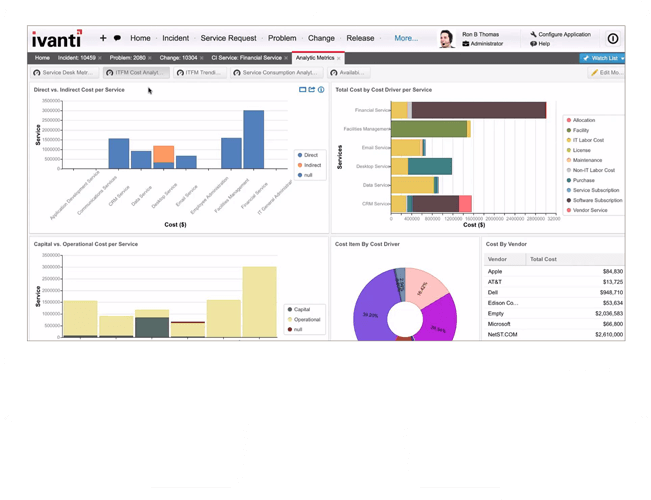 Monitor service delivery, quality and commitments with role-based dashboards that provide the real-time information, flexibility and tools needed to easily configure reports through a drag-and-drop interface. Several out-of-the-box dashboards & reports enable organizations to have a single view of operational, financial and productivity metrics to determine how well they’re meeting performance and business goals. Ivanti’s dashboards make it much easier to manage tickets. Everything is in one place. Managers love having the information they need in easy-to-use dashboards and reports.